“It is not often we are called upon to help one of our own. But this is the case with Nathan. He has been a devoted fan, batboy and now intern for the Orleans Cardinals and Firebirds for more than a decade. He is one of our OWN! Please consider making a donation to assist the Garran family, “ said Judy Walden Scarafile. 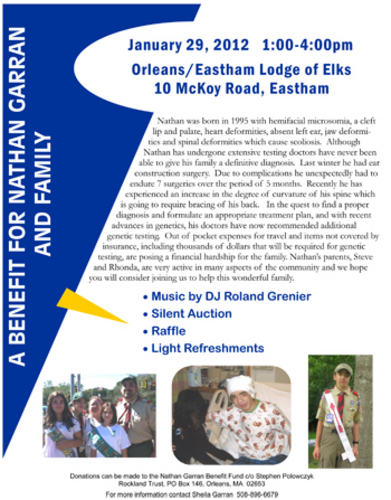 On Sunday January 29th there will be a benefit for Nathan Garran at the Orleans Eastham Elks. The benefit will run from 1-4 P.M. and will include a DJ, a silent auction and a raffle. All money raised will go towards paying medical expenses for Nathan Garran. Nathan, a 16 year old Sophomore at Nauset High School, was born with many congenital birth defects. Most notably he was born with one side of his face smaller than the other and without a left ear. Nathan began phase one of a three phase process to construct an ear last winter. Phase one was scheduled to be two surgeries with phase two beginning in August. Because of severe complications, Nathan underwent seven surgeries between December and May and phase two was put on hold indefinitely. During this time Nathan had to go to Boston as many as three times a week for doctor visits and was hospitalized for a total of nearly three weeks. He will need several major surgeries including major jaw reconstruction, phase two and three of ear construction, bone grafts and teeth implants in the foreseeable future. Nathan’s geneticist has asked that Nathan submit to two new diagnostic genetic tests which will hopefully help in Nathan’s care. He has had five other surgeries prior to last winter and has several other physical issues. The geneticist feels that it is important, with the new technology that is available, to do this testing. The results of the tests can be used to better pinpoint Nathan’s issues and care for him in the future. This testing is very expensive ($5,000) and is not covered by insurance. A generous friend who wishes to remain anonymous will match the next $2,500 raised AFTER the first $5,000 is raised. Ongoing medical expenses are high and he hopes to inspire people to raise more than what is necessary for this one expense. The Garrans are extremely active in the lower Cape community. Steve is a member of the Provincetown Lions Club, King Hiram’s Masonic Lodge, treasurer of the Orleans Athletic Association and a trustee of the Eastham United Methodist Church (EUMC). Rhonda is a Lion’s club member with the Lower Cape Cod Lighthouse Lions Club. Both are also very active in scouting. Steve is the Committee Chairman for Eastham Boy Scout Troop 83 and treasurer for Eastham Cub Scout Pack 83. Rhonda leads a Junior Girl Scout Troop, a Senior Girl Scout Troop, helped start two new Daisy Girl Scout Troops this year and is the Service Unit coordinator for Provincetown to Orleans. All three of the Garran children are active scouts. Nathan recently completed his Eagle Scout Leadership Project in November in which he built a handicap ramp at the EUMC. Donations can be delivered or sent in care of Stephen Polowczyk, Rockland Trust, PO Box 146, 70 Main Street, Orleans, MA 02653 and marked “Nathan Garran’s Benefit”. Raffle or auction items can be delivered or sent to Sheila Garran, 314 Millstone Road, Brewster, MA 02631. For more information call 508-896-6679. The silent auction will close at 3:30 p.m. on January 29th. All raffle winners will be selected at 3:45 p.m. on January 29th.